NetGalley is an online platform that enables influential readers – professional reviewers, media professionals, librarians, and educators – to download and evaluate your title pre-publication. It has reached a critical mass as a service and is used by mainstream publishers and self-published authors alike to generate pre-publication excitement and buzz for a title. As of Dec 2017 NetGalley has 380000 reviewers or "influencers" worldwide, and 45000 of those are in the UK. NetGalley claims the site is sticky, and that 65% of members come back nine times or more in a month. The majority of NetGalley readers are interested in Teens and YA, General Fiction, Mystery and Thrillers, and Sci-Fi and Fantasy, and there is least interest in Middle Grade, Humour, Horror, Sports, and Literary Fiction. We have also found that History, Pagan and Spiritual books get a decent response there. As NetGalley has grown globally they have created sites for different countries. Our books appear on the UK site (netgalley.co.uk) and the US site (NetGalley.com). As you would expect the .co.uk site prioritises British publishers and British books will be seen by more British reviewers. You can choose which countries and territories see your books. Every time a member logs into NetGalley they are presented with a selection of books based on their interests, normally starting with the books that have been most recently added to NetGalley. 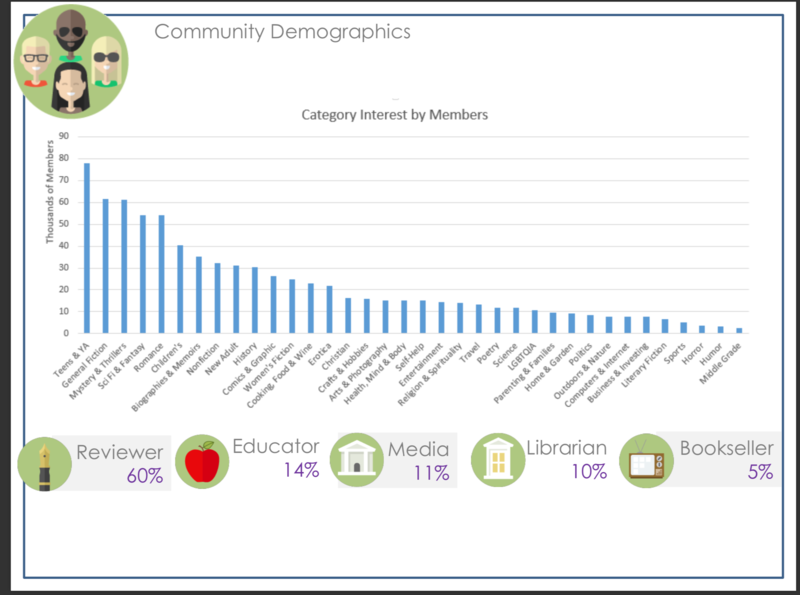 Members have the ability to search the site by many criteria including subject, author, publisher, and most-downloaded. You can offer your book for download in a variety of ways. Private: Only available to NetGalley members and other contacts you personally invite. Wish Only: This is NetGalley’s version of a giveaway. Anyone can wish for a title, and wishes are randomised and anonymous, so when you grant a wish you don’t know who it goes to. Available For Request: Members request titles, and you decide if they get to read them. You can filter who is allowed to request by member type (bookseller, educator, etc) and time period (eg you can allow booksellers to request during one time window, reviewers during request another). Read Now: Any member can download your book anytime. NetGalley offers the ability to create a widget. A widget is a pre-approved link which you can use to invite a contact to read a title on NetGalley. When a reader receives a widget link, typically via email, they can click on the link, register for free or login to NetGalley (if they are already a member), and are taken directly to the Title Details page for that title, where they can download it. NetGalley offers Activity Reports and Feedback Reports, so you can keep records of who downloads and reviews your books. NetGalley say views matter, so the more time a member sees your title, the more downloads and reviews you can generate. When you set a book to Available For Request or Read Now it will be presented to members on the NetGalley homepage for a few days, generating many views, usually resulting in a spike of interest and requests for download. After that, unless your book is causing a huge buzz, interest will likely be less intense as your book is harder to discover. At this point NetGalley offers a variety of extra marketing services at various price points which you can use to give your book an extra boost of visibility and gain more views. Whether it’s entering your book to be a Book Of The Month, paying to be featured on their homepage for a week, or a full mail-out to thousands of their members, these services are especially useful if you feel your book has real sales potential and you want to present it to the maximum number of influential readers, the maximum amount of times. Click here for the full NetGalley media kit, which contains details of all marketing services. IS NETGALLEY JUST FOR NEW BOOKS? The vast majority of books on NetGalley are new, but readers are also looking out for (in NetGalley speak) "interesting books they might have missed" and reviewers are taking "a more fluid approach to reviewing i.e. papers don't review according to publisher's schedules," so we are free to add in older books if we feel appropriate, and reviewers may review older books too. For example, if we add the second of a trilogy to NetGalley, we will likely add the first, so reviewers who missed it can read it. For an interesting breakdown of more facts and statistics related to NetGalley, click here. You can reach an audience that it would be very difficult and time-consuming to reach any other way. Readers download ebooks, so there is little cost to the author other than the NetGalley fee, and books can’t be sold on. NetGalley can save you an awful lot of time. Contacting and replying to bloggers and other reviewers can be a laborious process. NetGalley links reviewers' accounts to GoodReads, Facebook and Twitter so they can share their reviews with one click. NetGalley responses tend to mirror the real world – so if a title is popular there it gives you a heads-up to prioritise that title in your other marketing. NetGalley is used by many major publishers, and a lot of reviewers rely on it. Some reviewers will be searching for particular authors, books or publishers, but they will often stumble upon a new book or author who they may never have found otherwise. Readers are encouraged to add feedback, and most do. Many will also signpost the reviews they have written on their blog, and on Goodreads, and sometimes Amazon, or in a publication. Members can vote on whether they like your cover image, which can be a useful way to gain feedback before publication. Widgets can be used in other marketing communications, such as an emailed press release to bloggers. Again, it helps to cut down the time spent sending digital copies to reviewers. The main downside is the fee. There are no guarantees, so if listing your book doesn’t result in a decent amount of sales or publicity you have effectively wasted your money. Your $450 might results in hundreds of reviews and resulting purchases, or just a handful. There is no ‘pay per click’ option. It is very easy for readers to join, so there is no guarantee that the people who receive a digital copy of your book will share their review with many others. NetGalley is free for readers, but authors and publishers have to pay a fee in order to list a book. At John Hunt Publishing we pay to have twenty titles on NetGalley at any one time. As an individual you can choose to add your book to NetGalley at various price points. As of June 2018 to add a book for six months as an individual author the price, is $450. You can also save some money by adding your book through the Independent Publisher’s Association. HOW DO I GET MY BOOK ON NETGALLEY? If you have paid for an Extra Publicity service, you are guaranteed a placement on the site for at least three months. If we are promoting your title through NetGalley, it will be added as advertising to your marketing activities. Otherwise, we place books on NetGalley for different amounts of time based on a variety of factors including sales potential, genre, and past NetGalley experience. Four weeks is usually the minimum amount of time we add a book to the site. Rather than sticking your book on NetGalley and hoping for the best, think about building a community of influencers whose tastes chime with your books, and nurture those relationships. Every time you interact with a NetGalley member you are representing yourself and/or your publishing company and whether the member likes the book or not you have an opportunity to leave a positive impression about your work. Here are our top tips for using NetGalley based on our experience. Use widgets: We give reviewers who loved an author’s books, who regularly review for our imprints, and who consistently download our books, exclusive early widget access to corresponding new titles. Widgets are versatile, can be sent and accessed by non-members, and can be made to be part of press releases and promotional emails too. Use auto-approve: We auto-approve top reviewers and downloaders so they immediately get access to our books, and don’t have to request each time. Respond quickly: The quicker you respond to member requests the higher chance of a review. Make an approval strategy: Decide who has access to your book and when. E.g. you can make your book wish-only to start off with, available to librarians and educators and booksellers early (who all need lots of time to order books) and then open it to reviewers for a month or so before publication. Be positive: Warmly thank every member who takes the time to write a review. Customise your communication: Create a positive impression by customising the approval and decline emails for your title. Make sure members clearly understand your expectations, and if you declined, why you might have done so, and give them cause for optimism for future approval. Members who have downloaded but not reviewed a book. Members who have reviewed but not left a link. Chase them/contact them if you desire. We politely ask members who left positive reviews to cross-post them to Amazon and GoodReads if they haven’t already. We politely ask anyone who hasn’t left a review to do so in the weeks leading up to publication. Don’t add too many titles all at once. If you have multiple titles, STAGGER your titles, add them to NetGalley one a week rather than all 5 in one go. This will ensure the maximum number of views per title. Make the best reviews visible: While all members can see all reviews of your titles, select the best ones to display them at the top of your book’s page, so they will be the first reviews members see. Gauge sales potential early by looking at feedback. Are readers you expected requesting this title? Look at the comments to see if there are any recurring issues. Use detailed activity reports to see the full scope of those approved and declined. The reason for a request gives a good indication of which people are responding to in a title. We have noticed that genre fiction titles with a strong premise and simple title can generate many requests to read, e.g. Ghost Boy and A Graveyard Visible. Fairies, a Pagan title by Morgan Daimler, was only on the site a short time and was downloaded 149 times and 21 reviews were generated. Margaret Tudor, by Sarah-Beth Watkins, gained 1373 impressions, was download 290 times and 39 reviews were generated on the site. A perfect addition to the list of recommended reading for my A-level students. Not only do they look at ego, but the gender dynamics that can be traced back to the fall. Always a thrill to hear a review is read and well-received (I believe the author read it on Goodreads as well). Such a unique plot and I really hope a producer reads it and sees potential for the the screen – I’ve GOT to see the guillotine scene!! Yes, I’ll be asking my library to purchase a copy for readers. I hope it gets a wide readership. For Nigel Jay Cooper’s second novel, The Pursuit Of Ordinary, we paid for a NetGalley mailout to the NetGalley fiction email list. This resulted in 3383 impressions, 314 downloads of the site, and 63 reviews, many of which were rave. There were almost two hundred requests with a day of the email going out. From the beginning to the very end, this book will grip you tightly and hang on for dear life. It’s beautifully written! It’s a different concept! It works on all levels! I review on Goodreads, but most of the recommendations and feedback I give is in the busy store I work at. The owner always asks me to find the "next big book", so I have been reading up to 5 or 6 books a day! NetGalley is currently an invaluable tool in book marketing. While no author or publisher should exclusively rely on it to market their book, it’s clearly a powerful opportunity to present your book to influential people you could never have sought out on your own. You’ll have the opportunity to present your title to many booksellers and librarians you may never have considered or reached normally, and give yourself a real opportunity to increase online reviews for your book, on blogs and social media and especially on Amazon and GoodReads. The book market is saturated, and your book will be up against many others, which is why it’s vital you use the service with intelligence and care, doing everything that is in your power to create a positive and exciting impression of your work.